Mountain caribou is a variety of woodland caribou that, predictably, dwells in the rugged mountain of the North-West. The southern population of mountain caribou that dwells in the south of British Columbia is threatened by predation and habitat fragmentation, but the northern populations are healthy and legal seasons are open in Alaska and some Canadian provinces including Yukon and British Columbia. Requiring travel to fly-in camps in remote areas, mountain caribou hunts are typically between $10,000 and $13,000. In the same area a hunter can get to hunt many other species, including moose, sheep and (in some areas) grizzly bear, and combination hunts targeting more than one species typically are a better value. When to hunt Mountain Caribou? In the Yukon, mountain caribou hunting season starts August 1 and continues to October 31 (September 24 for special permit hunts). The same applies to Alaska. Outfitters, however, tend to prefer to hunt in September-October, when the bulls’ antlers are no longer in velvet, and they take winter fur, but before the rut is over and the bulls shed their antlers. Mountain caribou are mostly hunted by spot-and-stalk. Unlike tundra caribou, they don’t usually have mass migrations, making your hunt more predictable. During the hunt they are typically high up on the open ground, where they are relatively easy to spot but may be difficult to stalk. 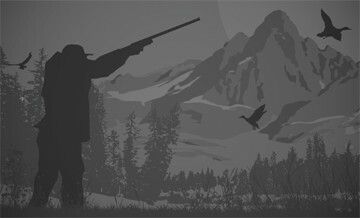 Boreal highlands are some of the most difficult terrain to navigate, so a hunter should be prepared for heavy physical activity. Indigenous peoples had a 1001 use for caribou, aside from eating its delicious meat and making clothes and tents out of its warm pelts. Modern hunters bring back from caribou hunting a bull’s large and impressive antlers, that are uniquely shaped and combine palms with points, with a prominent eye guard. In addition to these trophies, which are for a true hunter only material symbols of the challenge of the hunt, a great attraction for mountain caribou hunting is the feeling of being in the middle of nowhere in the unspoilt wilderness of the rugged mountains and primal woods. Without a doubt our Mountain Caribou hunt is among the best in B.C. They can be hunted as Single Species or We can add them onto most of our hunts. In September the Caribou come from miles around to rut in our area. Hunters wishing to primarily target caribou can expect to see 300+ in a normal hunt. Even as an add on to our Moose hunts most hunters see between 30 – 50+ a day. Bulls harvested during the rut average between 320-380 honest B&C points with a couple bulls close to or exceeding 400 mark each year. Most of our bulls have beautiful white manes, with white markings often running all the way back to the hip. The success rate on our Caribou hunts is usually 100% and even as an add on to a moose hunt most hunters take both animals. Caribou are hunted by horseback and a few by Backpack for the right client; we typically ride to several vantage points each day until we find a bull that you like. In the meantime we will see lots of these amazing animals which will often come within 30 yards of our horses, making for some great photo opportunities. If Harvest fees are required you will need to pay these BEFORE you go to camp. NO PERSONAL CHECKS ARE ACCEPTED UNDER ANY CIRCUMSTANCES (Certified Bank, or Cash only) In the past we have had issue with this and trusting some (what we thought) were solid guys. Sorry for the inconvenience. 2 x 1 Price $15,500 May 1st the year of the hunt final balance is due. We had some fantastic moose seasons lately in the Alaska Range. We killed a 70" whopper and many others in the 60s. Other hunters took grizzlies or other animals while on their moose hunt. Trophies are 50'+; Our moose can be combined with sheep, black bear, grizzly bear, caribou, wolf, or wolverine. If you have a physical condition that prevents you from walking far, please make us aware when you book a hunt and we can put you in a camp that generally doesn’t require as much physical exertion. Normally each hunter has his own base camp and hunts directly from there; but where it is feasible, the hunter might spike out with his guide. In most cases, the main camps are situated on the shores of lakes or rivers.